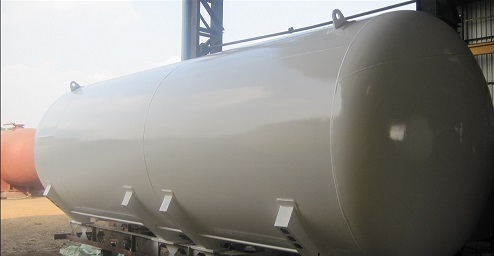 We manufacture tanks and vessels required for storage and transportation tanks of various liquids and gases like LPG, PROPANE, PROPYLENE, AMMONIA, LIQUIDCARBONDIOXIDE, CHLORINE , HYDROGEN, NITROGEN, OXYGEN, ARGON, SULPHUR DIOXIDE, BUTADINE, ETHYLENE OXIDE AND OTHER GASES , in a wide range of various capacities for use in domestic, industrial and transportation sectors. The manufacturing of these tanks requires special expertise , technology and strict quality control measures. These tanks are manufactured confirming to various design standards like ASME SECT VIII DIV I & II, AD- MERKBLATTER, PD5500, IS2825 and under the stagewise inspection of various third party inspection agencies like DNV, BVIS, TUV, LLOYDS ,PDIL and others. We are constantly involved in manufacturing and supplying various sorts of tanks and vessels like LPG Storage Tanks, LPG Semi Trailer Transport Tanks, Liquid Oxygen, Liquid Nitrogen, Liquid Argon Storage Tanks, Gas Plants/Turnkey Plants, Surge Vessels, Ammonia Tanks, LPG Tank, Pressure Vessels, Propane Storage Tanks, LPG Semi Trailer Tanks, Auto Gas Components, LPG Sphere, LPG Mounded Vessel, LPG Cylinder Filling System, Auto Gas Station, LPG Truck Tanks With Pump, LPG Bottling Plant, Storage Tanks, Natural Gas Plants, CO2 Tank, Hydrogen Storage Tanks, LPG Skid, Co2 Tanks & Cylinders, Oxygen Tanks, Ammonia Storage tank, LNG,Oxygen Tank, LPG Cylinders, LPG Gas Tanks, Ethanol Storage Tank, LPG Bulk Installation, Air Receiver, Argon Storage Tank which are required for storage and transportation of different liquids and gases. These products are preferred in various domestic, industrial and transportation sectors. These tanks are manufactured and fabricated with the help of special expertise, technology and strict quality control measures .These tanks are developed as per leading industry standards and they confirm to various design standards such as ASME SECT VIII DIV I & II, AD - Merkblatter, PD5500, IS2825. Plus, they are constantly tested on quality standards and are developed under the inspection of various third party agencies like DNV, BVIS, TUV, LLOYDS, PDIL and others. Further, we are engaged in manufacturing various kinds of Process Plant Equipments like Coded Pressure Vessels, Distillation Columns, Towers, Reactors and Heat Exchangers. We always adhere to clients’ various guidelines and are involved in undertaking turnkey projects to construct Fixed & Floating Roof Tanks, Mounded Storage Tanks and Plant Piping. Our efficient, reliable and effective manufacturing facilities are located at Pune; which is 160 km from Mumbai. We contain all the basic and modern infrastructure facilities to develop these products. We also include a highly knowledgeable and experienced manpower. Our facilities are highly appreciated in the market and these have been approved by Chief Controller of Explosives. We have gained a vast clientele in the market and our perfect execution, qualitative service and in-time deliveries are highly acclaimed in the market.